Owl Crafts have always been some of my favorite. They are just so cute! 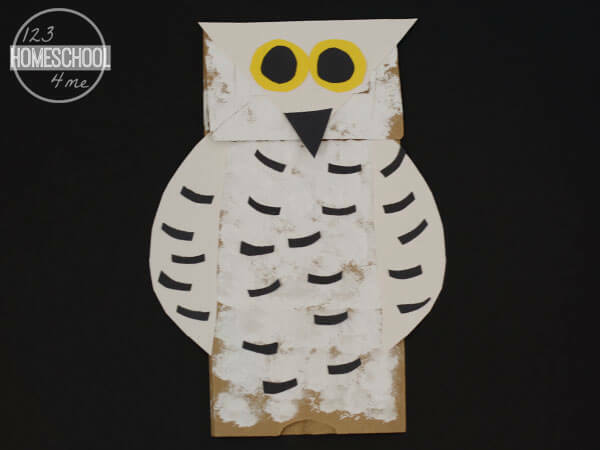 With winter coming, we decided to make a snowyOwl Paper Bag Puppet Craft. Have you ever seen a snowy owl? They are so beautiful! 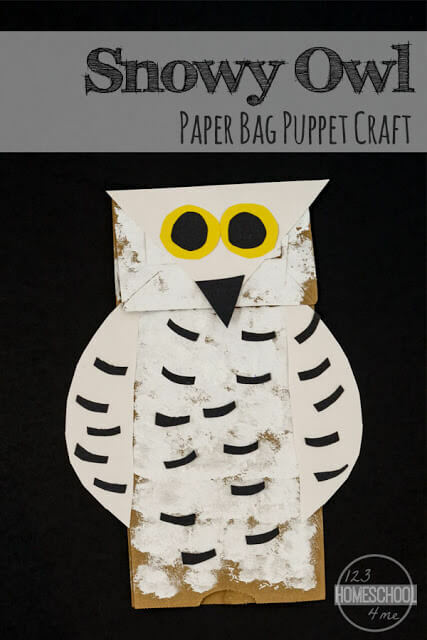 Make a paper bag puppet version with this fun craft! 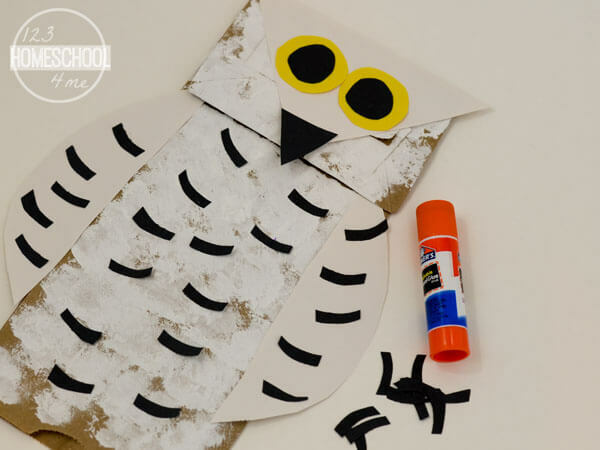 We recently made a super cute snowy owl craft using black paper and white paint. I love the way it turned out. So I was inspired by that to make this paper bag puppet version. 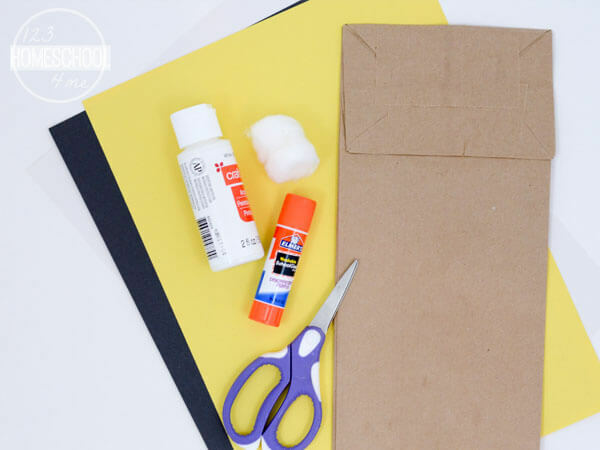 This craft uses simple supplies you may already have around the house. Simpy cut out the pieces beforehand, and then let the kids paint and glue the pieces on. Black: One triangle for the beak, and two round black eyes. Optionally cut several small crescent shapes for some black feathers. Yellow: Two eyes, a bit larger than the black circles. White: One triangle, slightly wider than the paper bag, and two semicircles for the wings. 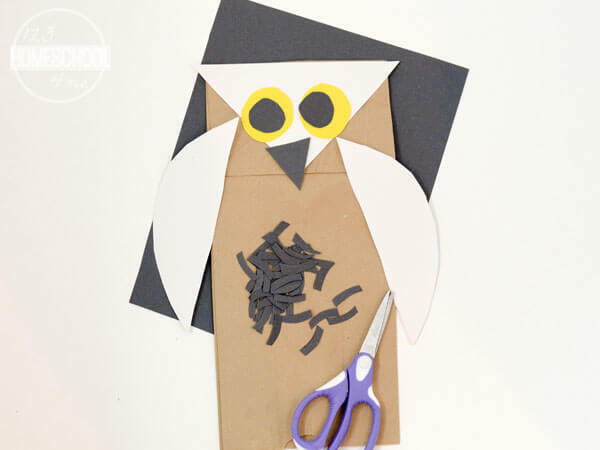 Once the paper pieces are cut, it’s time to make the owl! 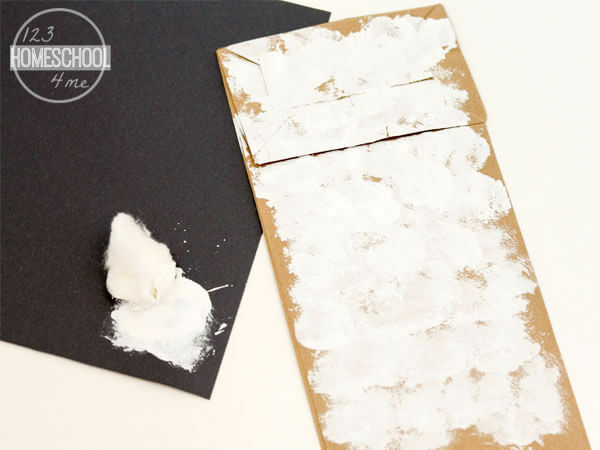 First, paint the front of the paper bag with white paint using a cotton ball. Do this by dipping the cotton ball into the white paint, and then dabbing it all around the front of the bag. Doing this makes the owl look fluffy with a lot of white feathers. After you are finished painting the feathers, it’s time to glue on the paper pieces. First glue the white triangle onto the top of the head. Next attach the white wings to the side. Glue the yellow eyes on top of the white triangle and then glue the black circles in the center. Next add the black beak. Finish by gluing the black “feather” pieces all around the front of the owl. Let the snowy owl dry, and you’re finished! Use this owl to act out owl songs or stories. These would be great to go along with the book Owl Babies, and would go great with a winter or Arctic animals theme.